From the moment I first set foot in Tuscany 40 years ago, I knew this was a place I wanted to be; and from the moment I first tasted panzanella salad, ribollita, bistecca fiorentina, and crostini neri, I knew that Tuscan food was what I wanted to cook, to eat, to feed to my family and my friends. 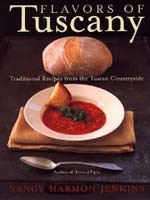 Flavors of Tuscany grew out of that passion for all things Tuscan, but especially la cucina toscana. More than a cookbook, though, this is also a memoir about my family’s long experience living, working, playing, gardening, and of course eating in a farming village in the hill country between Tuscany and Umbria. 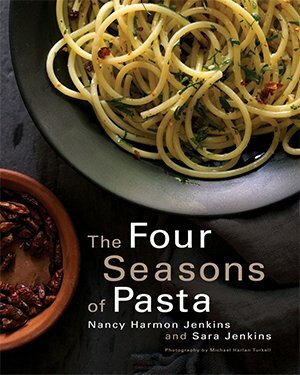 From the first page, Nancy Harmon Jenkins draws you deep into the soul of Tuscany, where she lives part of the year and where tradition heavily shades daily life. Jenkins calls Tuscans “the Yankees of Italy” because they are as frugal and plainspoken as the New Englanders with whom she grew up. 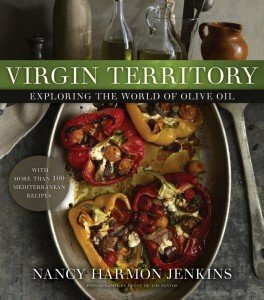 Their food is elementally simple, relying heavily on the region’s unique, salt-free bread, pane sciocco, the intense olive oil that has become famous around the world, and beans slowly cooked in a tall clay pot, or fiasco.